The WLA is in the shadow of the giant Mundelein Center, formerly a Catholic women’s college run by the Sisters of the Blessed Virgin Mary (BVM). The school eventually affiliated with Loyola University next door, but in its sixty years of operating, the nuns and their students developed traditions unique to their school. When I started looking through the college’s materials here at the WLA, I didn’t expect to necessarily have much in common with the student of Mundelein College. I should not have doubted, however, because their traditions have many similarities to my K-12 Catholic school upbringing. 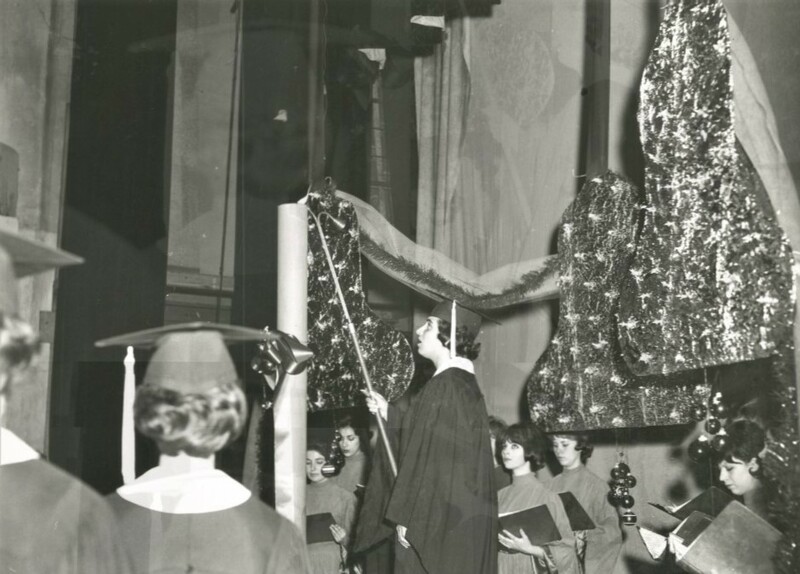 Mundelein students and staff had two major traditions over the decades: the Candlelighting and the Cantata. I relate to both of these activities in different ways, as I’ll describe below. Candlelighting at Mundelein was a ritual welcoming in of the holiday season. 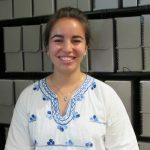 As Nancy’s post explains, the students and nuns lit candles on each floor of the college’s skyscraper to form a cross. This cross was visible from the street, making it an impressive sight. In later years, they also lit interior candles as a group and sang carols. 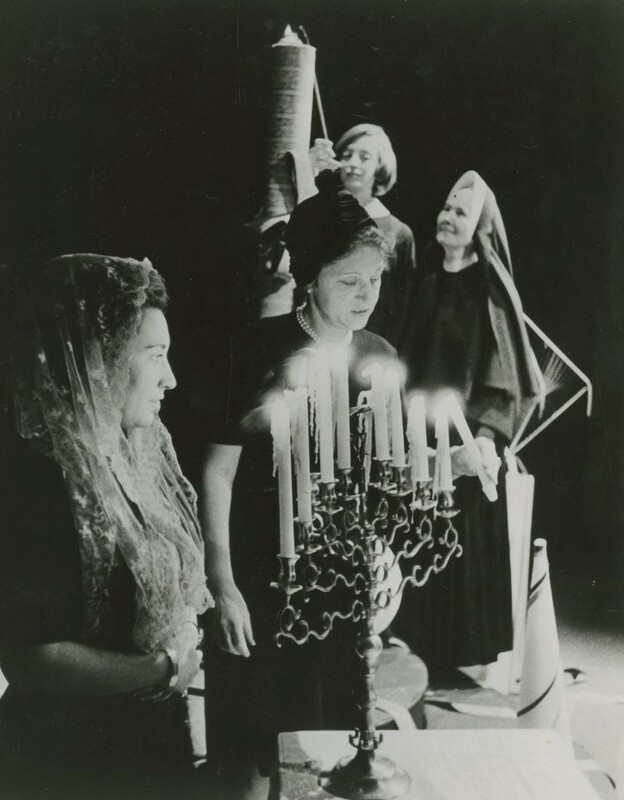 My favorite photo of Candlelighting shows two students, a nun, and a staff member lighting a large candle alongside a menorah! I’d never seen evidence of Jewish life on Mundelein’s campus, and this representation of the Jewish holiday of Hanukkah was a lovely touch to the ceremony. It’s also interesting that the photo’s perspective is focused on the menorah lighting, with the Catholic candle taking a background role. Though it may seem odd that an archival photo could feel special, this one is to me because of my family’s dual faiths. I grew up practicing both Catholic and Jewish traditions, and it’s important to me to find ways to represent both religions. Lighting candles carries across both of them. Another Mundelein tradition was the Cantata, a kind of holiday pageant based around the story of Christmas. Students wore a variety of costumes and the school choirs performed. I enjoyed the photos of students in interesting outfits – their costumes remind me of the red bow ties our school choir wore in our Christmas pageants! Some photos of the Cantata choir in the Mundelein papers reminded me of the wonderful experiences I’ve had in choir throughout high school and college. We wore long black dresses (the men wore suit and tie). Each December, my high school’s choirs would perform holiday music in the gym for the whole school. 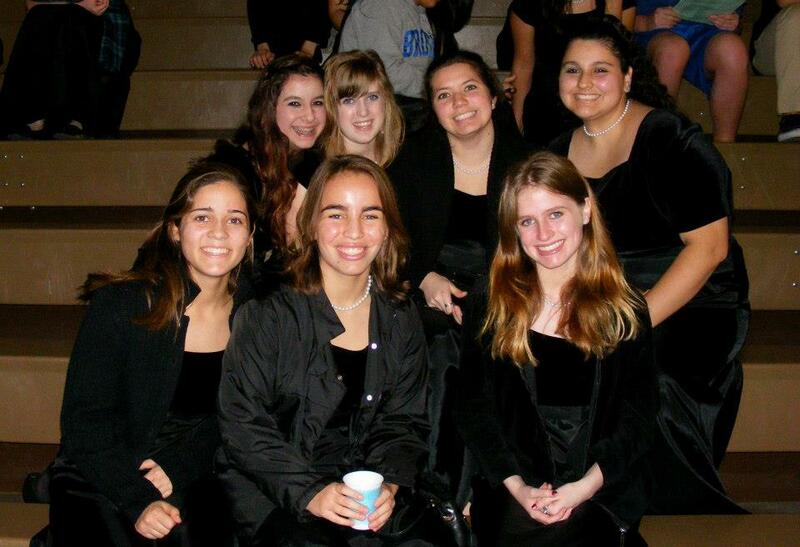 It was always a highlight of the school year to sing all the music on which my friends and I worked so hard. I am sure it was the same for the Cantata choirs. 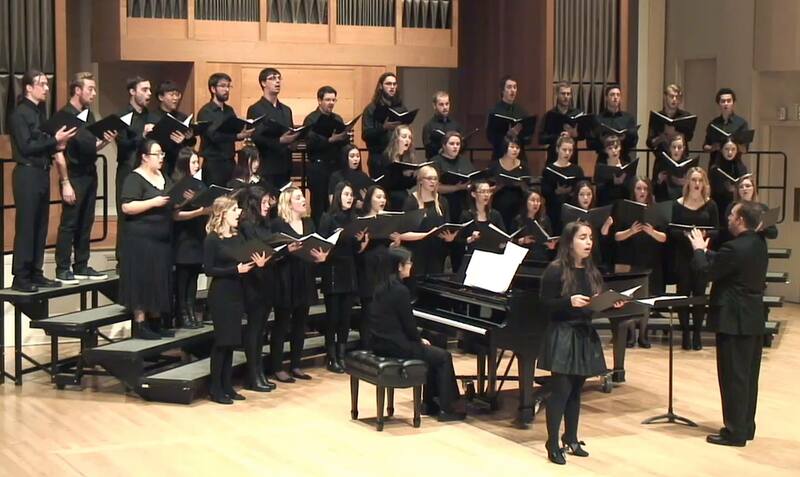 In December of my senior year at the University of Oregon, my choir also performed a holiday concert, which I enjoyed immensely. 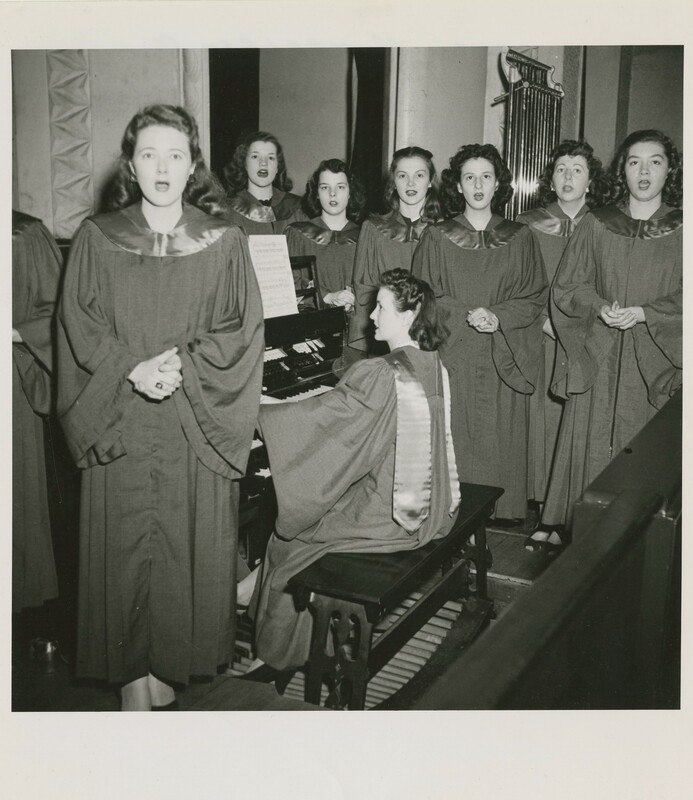 Maybe I’ll be able to find time to join a choir at Loyola next year – we’ll see! To close, I’ve inaugurated a new holiday tradition of my own. I go to see a choral concert every December, and the last two years I’ve been lucky enough to see the famous group Chanticleer. In 2016, I heard them in Sacramento when they visited the Cathedral of the Blessed Sacrament, and this year I’m excited to see them in Chicago’s Fourth Presbyterian Church in River North. It’s fun to have a tradition I can repeat for years to come and share with others, just like the Mundelein students shared with new students each year. Happy holidays! This entry was posted in Uncategorized by Women and Leadership Archives. Bookmark the permalink.